This group is just as likely to be seen on stage with a modified car muffler, a cigar box, a coffee can secured to the end of a pool cue, or an ordinary block of wood with a string nailed to it, than they are a with a Fender Strat or a Gibson Les Paul. These are the top 10 current (non-traditional) blues guitarists that are as comfortable off the beaten path as they are on it. Clarksdale’s favorite son has been creating his own instruments – often called ‘Chiktars’ – from shotguns, gas cans, cigar boxes and garden tools for decades. These colorful and highly-decorative instruments are as much a treat for the eyes as they are for the ears in the hands of Chikan. Check out: “Sippi’Seekan’Saw” from the album Sum Mo Chikan. With the prodigious talents he possesses, it’s no wonder that so many bands want Dickinson to come on board – for an evening or for a tour. It doesn’t matter if he’s armed with an old-school diddley bow, or equipped with a bizarre-looking coffee can guitar, the hill country sounds of past masters like R.L. Burnside and Junior Kimbrough are alive and well in Dickinson’s capable hands. Check out: “Rollin N’ Tumblin” from the album World Boogie is Coming. Another purveyor of the north Mississippi hill country blues, Johnston’s cigar box playing made him an international sensation long before he ever ventured off the sidewalks of Memphis’ Beale Street, where he could be found playing most nights of the week. Special credit for the reverence this one-man band held for the late, great Jessie Mae Hemphill. Check out: “Work Me Baby” from the album Foot Hill Stomp. As at home quoting a Joe Strummer (The Clash) lick as he is one by Charley Patton, the righteous Rev. Peyton and his crew are all about high-energy, all the time. The finger-picking skills he has developed on his 1930 National are impressive, but when he cuts loose on his cigar box, it’s next to impossible for the listener to remain in a seated position. Check out: “Easy Come Easy Go” from the album Between the Ditches. With the way he caresses his homemade diddley bow and hammers away at his cigar box, Seasick Steve has become a major figure in roots-based music across the pond. Just as likely to be on stage in one-man band mode as he is to be backed by a drummer, it is high time Seasick Steve received all the accolades he so richly deserves here in the States. Check out: “Diddley Bo” from the album Man From Another Time. 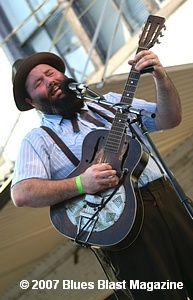 Not nicknamed ‘Chainsaw’ for his prowess in the timberlands of his native Kansas, Aaron Moreland was tagged with that handle because of the way he attacks his guitar. 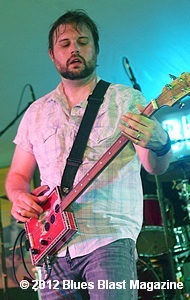 Though he was basically handed a cigar box guitar just minutes before climbing on stage a few years ago, Moreland quickly gained exquisite command of the instrument and has since made it a key component in Moreland & Arbuckle’s sonic assault. 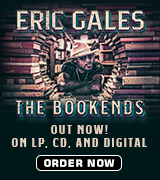 Check out: “Tall Boogie” from the album 7 Cities. This Florida-by-way-of-Arkansas guitarist was influenced as much by Metallica as he was by B.B. King. After lengthy stints playing in death metal (?!!) bands, he’s now focused solely on the blues. 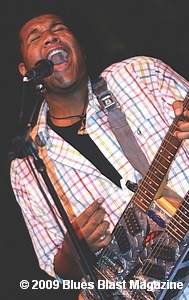 Soars’ head-turning talent is often demonstrated on cigar box guitars that he and his brother construct from scratch. Check out: “They’ll Do it Every Time” from the album More Bees with Honey. Formed and playing blues festivals before two-thirds of its members had even graduated high school, Homemade Jamz Blues Band sounds like a group that has spent decades playing together on the road. As headline-grabbing as the young sibling trio’s ages were when they first made a splash, is the handcrafted guitars and basses that father Renaud Perry made for his sons out of car mufflers … and his son’s abilities to crank out the blues on said mufflers. Check out: “Burned Down the House” from the album The Game. Every bit as swampy sounding as his Florida birthplace might suggest, Prestage’s albums have failed to ignite any kind of major buzz on a national level at this point in time. Hopefully that changes in the near future, because as anyone who has caught this gifted one-man band live and in-person knows, his cigar box playing is worthy of all the praise it can get. Check out: “Preachin’ Blues” from the album Beale Street. Blues artists have always been a bit different from more mainstream musicians in the lifestyles that they live, the subject matter that they write about and in the way they bring that writing to life in front on an audience. Those differences carry over into their musical weapons of choice, as well. All the cats listed below can wail away on a regular six-stringed guitar with the best of them. However, what sets this group apart from the pack is their ability to blow a person’s mind with instruments that are much more simple – while at the same time much more creative – than a guitar merely plucked off the wall at the local music store. Final note: Amazing guitarists such as Robert Randolph, Ben Harper and Damon Fowler could very easily have secured spot on this list had I not chosen to focus on artists that lean toward ‘homemade’ types of instruments, instead of the sacred steel, Hawaiian steel and lap steel that Randolph, Harper and Fowler favor. I think Mac Arnold, who was playing his gas can guitar long before most of the people on the list were born and continues to put on a good show, is also worthy of mention in the article. Totally agree on Mac Arnold, Ken. I could have easily put him on the list along with a few others that I debated on where to place: Bluesboy Jag, Too Slim, Rev. 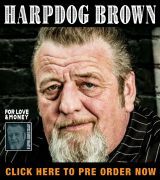 KM Williams and even though he’s not really blues – Jimmy Driftwood. Always dug his guitar made out of a 100-plus year old fence rail.